Check out Tobi's Jaymes Drape Blazer There's nothing like a blazer to pull your look together in a flash. The Black Jaymes Drape Blazer is an open front jacket that combines softly draping lapels with jetted pockets for a masculine edge. We like it paired with denim for an outfit that looks like you tried—but not too hard. There's nothing like a blazer to pull your look together in a flash. The Black Jaymes Drape Blazer is an open front jacket that combines softly draping lapels with jetted pockets for a masculine edge. We like it paired with denim for an outfit that looks like you tried—but not too hard. There's nothing like a blazer to pull your look together in a flash. 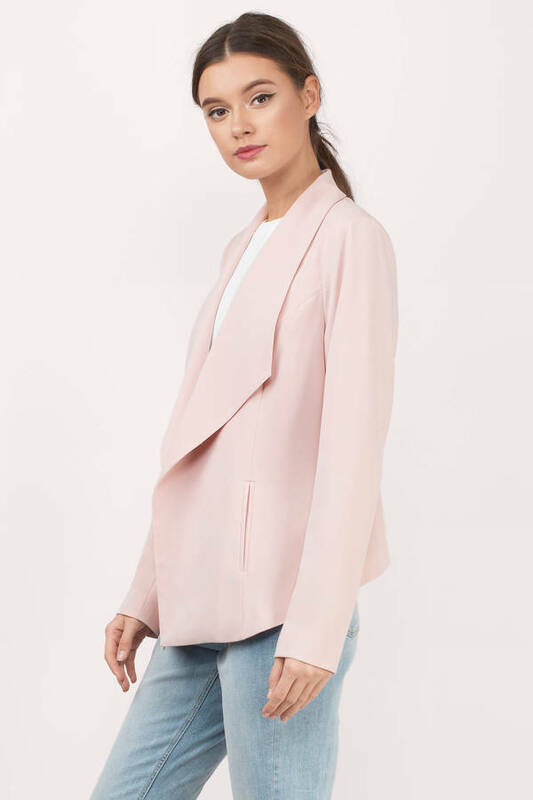 The Blush Jaymes Drape Blazer is an open front jacket that combines softly draping lapels with jetted pockets for a masculine edge. We like it paired with denim for an outfit that looks like you tried—but not too hard.